Its one of granny's recipe. Very healthy, soothing and comforting. This could be done with any green leafy vegetables. I made it with spinach. Check out the nutrition benefits for spinach. 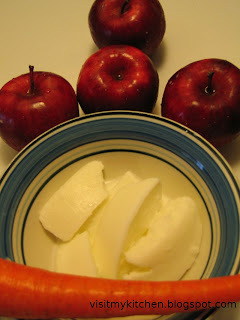 Beat curd to thick buttermilk. Make paste from grinding Red chillis, cumin and coconut adding little water. Wash well and chop the spinach. Pressure cook till soft. 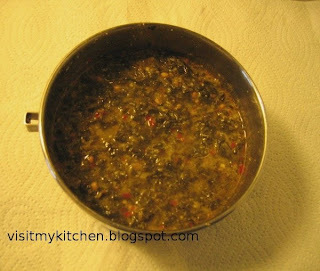 Add ground paste to boiled spinach, cook for about 5-8 mins. Finally add buttermilk,salt. boil for 2 mins (till a boil) not more. 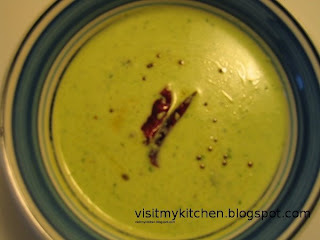 Temper urad dal in very little oil and add. **If its not thickened enough, add 1 tbsp of rice flour mixed with cold water and cook for few mins. ** Can add 1 sp of tamarind if butter milk is not sour. 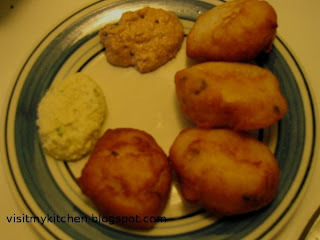 Kovakkai / Tindora has become one of the rare delicacy after coming to US. In a wide pan, pour 2 spoons of oil, once hot, add the tindora. Saute them couple of times to coat them evenly with oil. Leave undisturbed and cook on medium-high. Keep a check else it may stick to bottom. 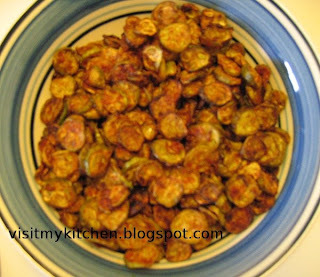 Every five minutes saute them slightly so that they fry evenly. Once half done, add salt. 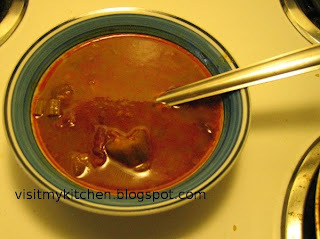 Finally add chilli powder + sambar powder , add 2 spoons of oil, saute for 5 mins. Serve hot wiht rice / Roti. Per choice, onions can be added. This goes well with Roti too. Sieve all purpose flour and sour curd without any lumps. Set it aside for 6-8 hrs. Add and mix well the rest of the ingredients to make the batter. When oil is medium hot, drop in small balls of batter using big spoon. 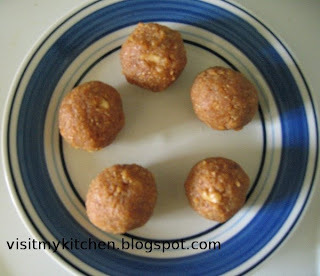 I love this for the color...the taste..the simplicity and I love this more than carrot halwa..
A very quick dessert item..
Fry chopped nuts in 1 spoon of ghee and set aside. Add 2 spoons of ghee to the tava, when hot add grated beets and fry for a minute. Half way thru add sugar,mix well and cook till milk is absorbed and beet is cooked well. 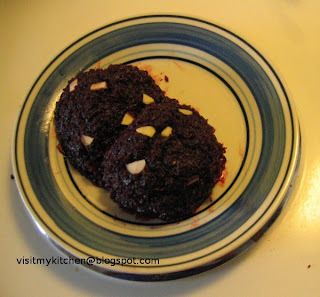 Cook till the mixture solidifes and come out from the sides and sets to a nice halwa texture. Switch off, Garnish with fried nuts. -- If beet is very old, boiling takes longer time. This case, try to steam the beets for few minutes till they are half cooked and then proceed as above. --Instead of milk, one can add condensed milk / khoya. Or partly whole milk and partly khoya. A simple quick and healthy upma. In little oil temper urad dal, channa dal. Once they are slightly brown add mustard, once they splutter, add red chilli, hing and turmeric. Saute for couple of seconds and add water. Add tamarind paste to the water. Add salt. 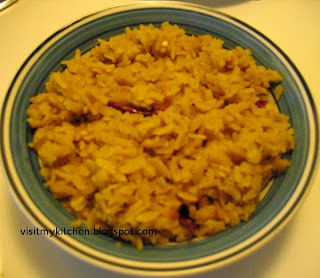 Once it comes to a good boil, add the poha (if its not clean, can wash and immediately add). Cook closed in Low-Simmer mode for 5-7 mins or till done. I simply love this cake than all the others I have ever tried. 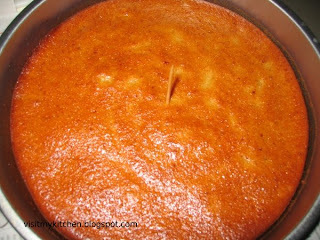 I love the banana flavour and this cake comes out little moist and its very very delicious. ** If adding brown sugar, the quantity can be increased by 1/4 to 1/2 cup more. To the above dry mixture, add sprite, vanilla extract, pureed banana, sugar-oil-egg mix and beat well till they are uniformly mixed. Finally add nuts and give a nice mix using hands. The batter will not be very thick, it will be little thin, which is fine. Spray the cake pans with oil. Pour the cake batter only till 1/4th or little above 1/4th of the pan. Bake for about 50 mins to 1 hour or till top comes out thick brown. Insert a toothpick and test if it comes out clean. Take it out and let it cool down for 15 mins. 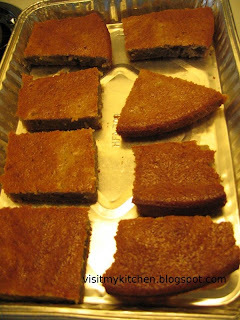 Recipe source: - I referred recipezaar but the above recipe varies in some of the measurements/ingredients. Sieve together Gram Flour, Rice flour and salt. Keep the Bhoondhi laddle above the oil, carefully add the batter to the laddle, such that the bhoondhis fell into the oil. Fry till its golden yellow. Transfer it to kitchen napkins. ***Rice flour if added very much, can give crispness but alters the taste. ***Round Bhoondis are got when there is enough oil for the Bhoondis to immerse. I am quite stingy to do that :) and hence my bhoondhis are never in good shape. Beat the curd to thick buttermilk stage. 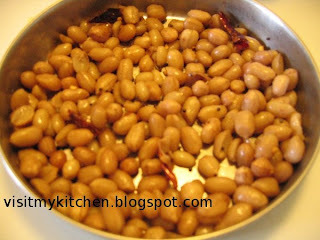 Add the bhoondis and salt. This needs about 20 mins minimum for the Bhoondis to get soaked in curd. ***As an alternative, soak the bhoondis in warm water for 5 mins and then add it to curd for quick soaking. this way some excess oil also is taken out from bhoondis. In a nonstick tava, add 1 sp oil and fry the onions till pink. When they are half cooked, add salt and saute for few more minutes. Add red chilli powder and curry powder, fry. Boil the peas with pinch of salt and just enough water until it is cooked.Keep it aside. 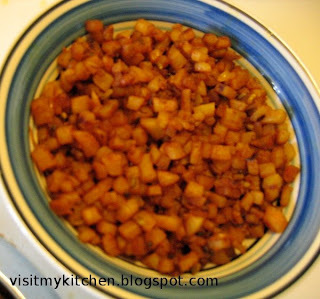 In little oil, fry ginger and garlic. Add chopped onions to it and fry till pink.Add chopped tomatoes.Let it cool for sometime. Once cooled, grind this to fine paste using mixie/blender. In little oil/butter, saute cumin,saunf.Add cloves,cinnamon, cardamom,poppy seeds and fry for few seconds. Add the ground mixture and bring it to boil. As onions/tomatoes were already cook, it is enough to boil a couple of minutes until they heat up. Add red chilli powder, coriander powder, garam masala pepper powder,salt. Mix well. Add shelled peas. Boil till the peas set well in the gravy. - Add 1/2 to 1 spoon of sugar (depending on the batter amount) to get a nice colored crispy dosa. You can feel an immediate change in color and crispness if you add sugar. 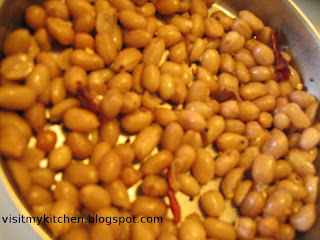 - While making dosa batter, add 2 spoons of Tur dal/Channa dal,soak with rice, this gives a nice color to dosa. - Add 1 sp of methi and soak along with rice, Not only methi is very good for health, it also adds a great flavour to the taste. 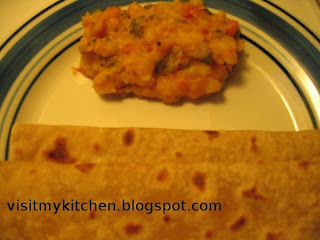 -Adding poha while making dosa batter gives softness to the dosa. - Add 1 sp of eno fruit salt to the batter (just before making dosas) , dosas will come very porous and good..
Coriander - Who doesn't love the aroma of it, Not to miss out its beautiful green color. Makes the dish colorful and flavourful. Few health benefits of cilantro are Protects against salmonella bacteria, Aids in digestion and helps settle the stomach and prevent flatulence, Protects against urinary tract infections,Lowers blood sugar,Lowers bad cholesterol (LDL) and raises good cholesterol (HDL), A good source of dietary fiber, A good source of iron, A good source of magnesium,Rich in phytonutrients and flavonoids, Relieves intestinal gas. This pulao is pretty simple. Goes well with any Raitha as a sidedish. Grind to paste, all the C's :) Coriander,Chilli,Cashew,Coconut with salt. 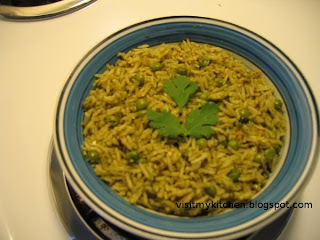 Add cumin, peas, the ground mixture and little bit of ghee to the basmati rice. Mix well and cook till grainy. Once cooked, bit of pepper powder on top. This is optional. 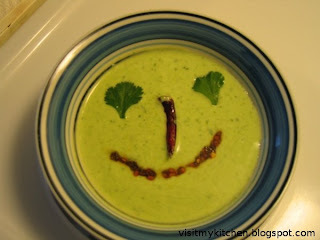 This entry goes to the food blogger Cilantro’s Cilantro Jihva Event.